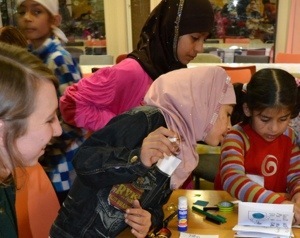 Scarlet’s story supported a one day workshop of creating books and making music at The Asylum Seekers Resource Centre. Families came and participated in telling their own story and making a book to share. Some beautiful books were created with the help of Kids’ Own Publishing, a lovely lunch was made and shared and songs were sung.